The latest from Dorcan Ward. Bluh's effort made me laugh. Seems like Bluh is claiming the credit for the minimal amount of work done in Dorcan by Kevin Parry and 'the other one'. I'm not slagging Parry or 'the other one' off exactly, they're probably too busy taking care of Bluh's ward case work to do much else. 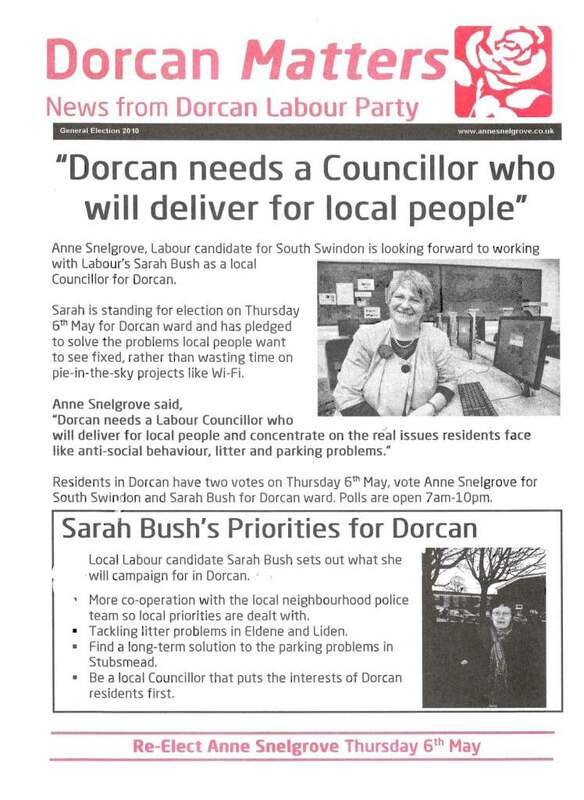 Anne Snelgroves 'Dorcan Matters' leaflet is s slightly different kettle of fish though, at least she and Sarah Bush are aware of, and mention a few of the ward problems which remain unattended-to after several years of Bluh ignoring Dorcans 'little issues' in favour of his own legacy politics and vanity projects. I'm sure Annes points about Bluh removing Â£500,000 from the roads budget, unrepaired potholes and the WiFiasco won't land on ears as deaf as his own. The wincie footnote,' we pay for our leaflets yah boo' really aggravates me. What an inane, silly, pointless use of print. ...even down to claiming credit for stuff that wasn't thier idea or initiative or funding. A rumour, and its just that, was that a certain Cllr wasn't very keen on 'delivery' of a play park.......... i'll ask about and try to name them for sure and what was said. don't know know if some one as humble as myself will get hold of any evidence though. 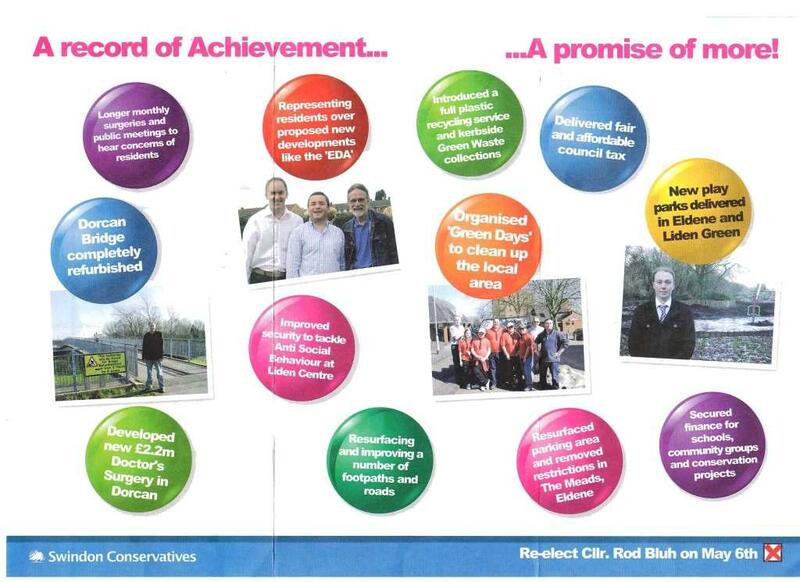 Leaflet I've just received was printed in Nottinghamshire. The Tomlinson monopoly of local blue printing seems to have been broken. I always remember recieving a letter from Simon Coombes MP on my 18th Birthday, inviting me to join the Conservative party, which was printed on house of commons headed paper in a house of commons envelope! Wish I had kept it. Simon. Now there's a name from the past. Was he the chap that met a Pieman going to the fair? 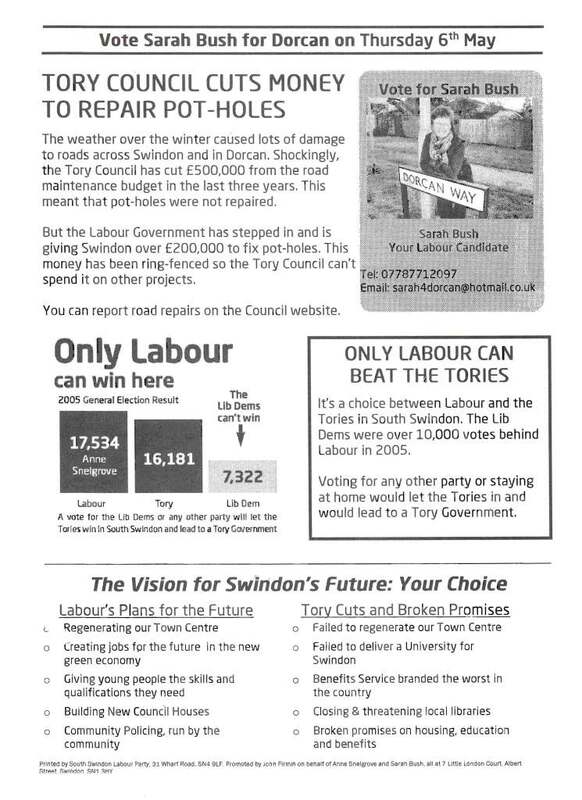 I have a simon coombes leaflet if you want a copy? Don't think any of my election leaflet will be delivered in dorcan itself. I've limited mine to the streets that have Resident's Parking to maximise costs. I have a feeling people in the CPZ are slightly more ticked off and more likely to Protest Vote. I personally think that the the electoral data could be used to cut down on wasteful and costly leaflets. Any candidate should be able to deliver a PDF to the Electoral department and then everyone that had registered an existing email address would get a copy of all the parties leaflets..
That way they wouldn't have to hand over half the electoral records and people data would be safer.. Think of the reduction if paper waste too! But this option is tooo far fetched..
Ploitics has to be fairer and allow people to hear from all the candidates and not just the richest or parties with the best non domicile sponsers..
Ah, fiscal policy by Brown. Aye? what? What have I done now?? That was a clear grammatical error, or indeed a sincere endorsement of Brownanomics. Six of the best I reckon and 93 latin conjugations and banned from being blackboard monitor. Oh I see, clear as mud, I had one of those once, but the leg dropped off. Have you been on the painkillers and cider again Mart? Actually I'll be very surprised. As for the effin glue. Look at the bloody time. Yep, felt like that myself after putting together the kitchen and bedroom. Like I said the leg fell off mine, could be I had run out of glue. Anybody know how things are going on in Dorcan? Is it to be Rod of Wi-fi fame or Sarah? Anybody got a clue and who will get what majority. I here that Sarah is coming down the outside. Will she beat our Council Leader and take out his 800 vote majority from last time? Sarah has a hard job, she is facing a popular well liked and greatly admired Conservative council leader, who is also on the police authority, who holds regular surgeries and has a mountain of emails from the Dorcan Ward. He is on The Police authority so he is busy ensuring that the police are responding and is on the RGA or something like that so can keep an eye on the 12,000 houses Eastern development. He is also busy cleaning graffiti and picking up litter in his off duty time, fortunately out of the goodness of his heart he allows the other two cllrs to appear in photographs along with Robert Buckland to be associated with the credit and hope that some of his shine rubs off on them. It looks like the majority is a forgone conclusion. Not what I hear on anything you have written Ringer in fact it has been reported to me as exatly the opposite. 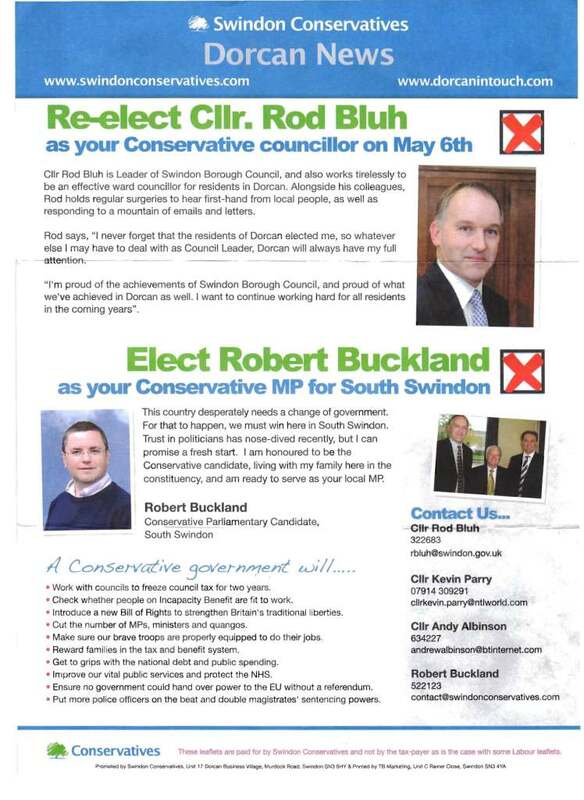 Well obviously you have read the Rod Bluh's leaflet, it clearly states what I have posted, unless I am misunderstanding it? Page created in 0.762 seconds with 29 queries.